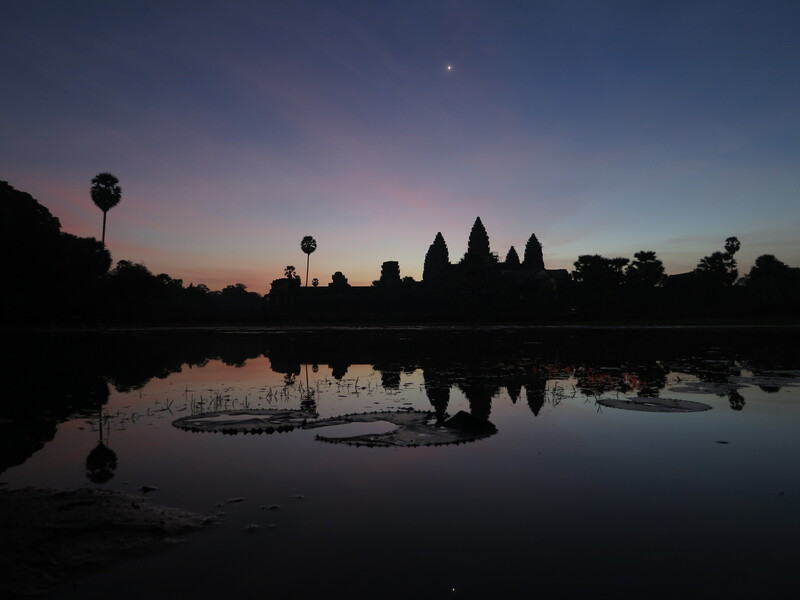 But we soon reaped the benefits: of the literally two hundred or so massing on the shores of the lake in Angkor Wat, we were up front, in prime spot for the three hundred photos I took over the course of about forty-five spectacular minutes of watching the sun rise behind the temple. After which we returned to our tuk-tuk to embark on our biggest day yet: the ‘Large Circuit’ (aka ‘Big Circuit’ or ‘Grand Circuit’), a collection of sites a little farther out from the central area of Angkor which we’d covered on the first day. 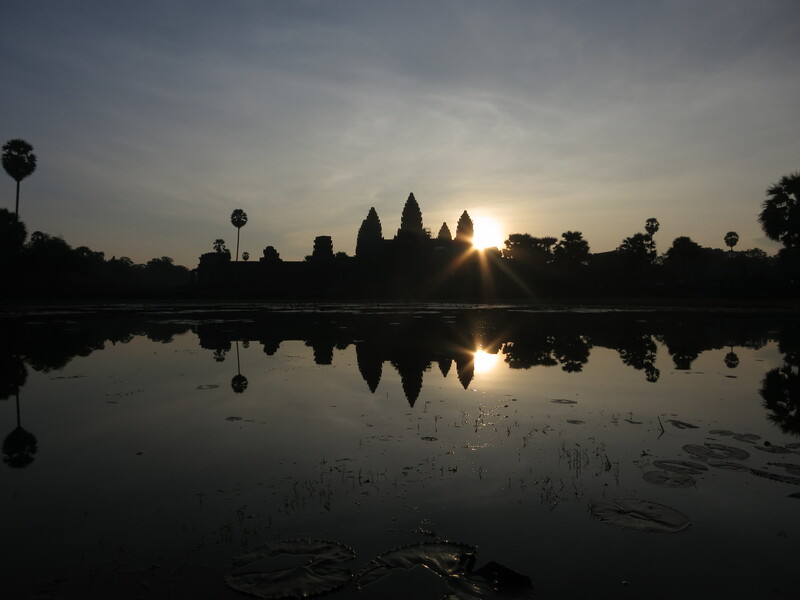 The sunrise at Angkor Wat was the day’s highlight, but there were still plenty to see for the rest of the day, even if it couldn’t live up to that early morning spectacle. Although of course first there was the fact that we hadn’t had our usual ridiculous breakfast. So we may have waited until a café opened its doors just opposite Angkor Wat, and gorged ourselves before setting off again. 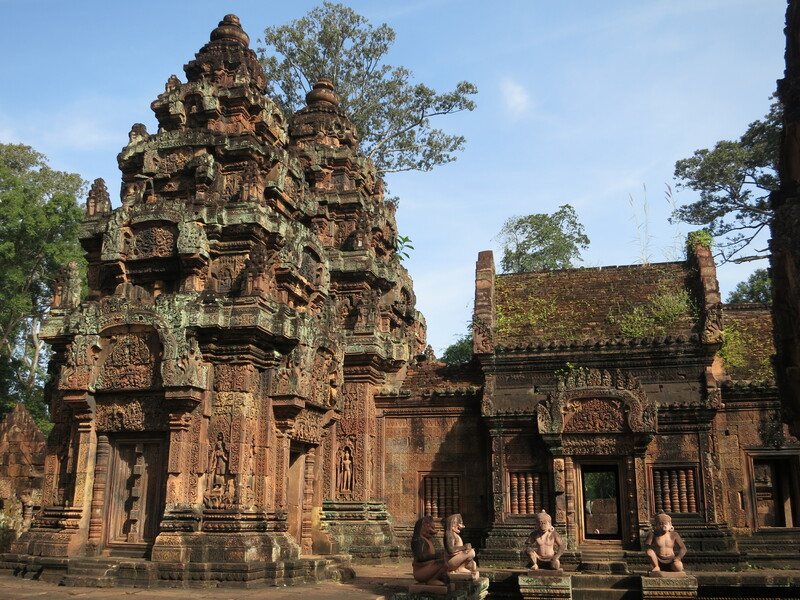 Our first stop was Banteay Srei, a red sandstone temple around thirty or so kilometres from central Angkor. 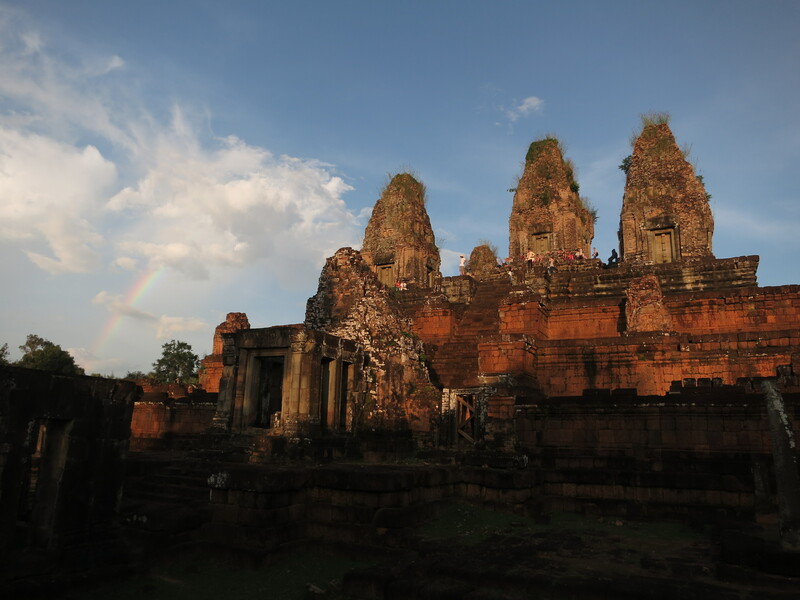 After the largely-grey weathered remains throughout most of Angkor, the ornate carvings and the radiant red of this temple was a vivid and enjoyable contrast. 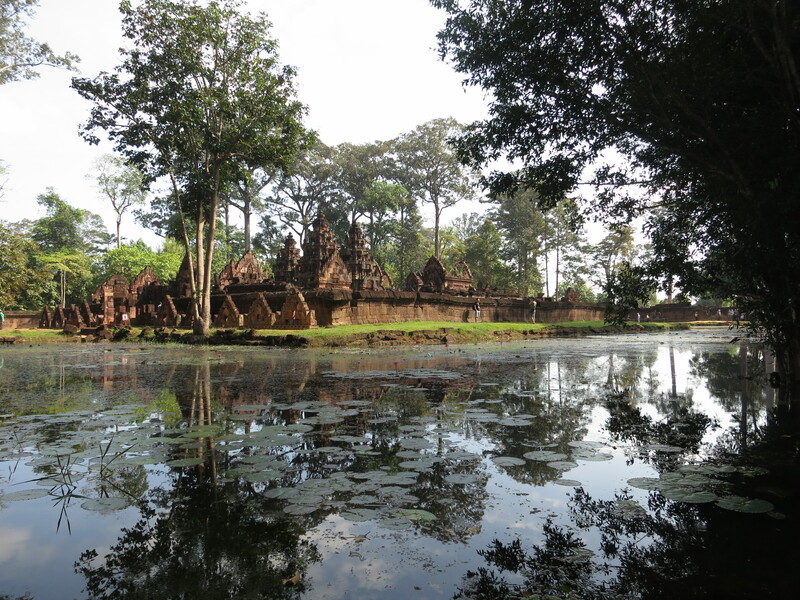 From Banteay Srei, we moved farther away, to Kbal Spean. 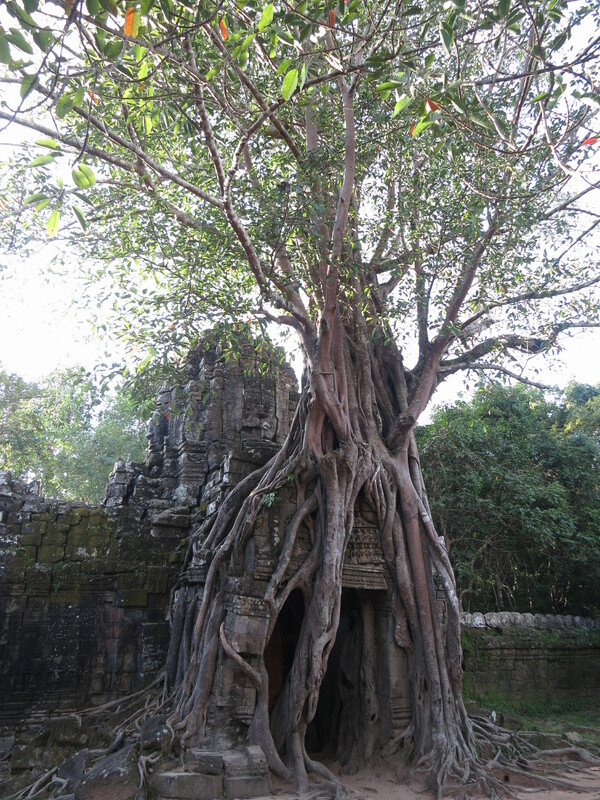 This, I’ll admit, was probably the one disappointment of our Angkor adventures: after quite a nice hike up a hill through jungle to get to the site, there’s just really not much there. Basically, it’s a few engraved stones in a riverbed. 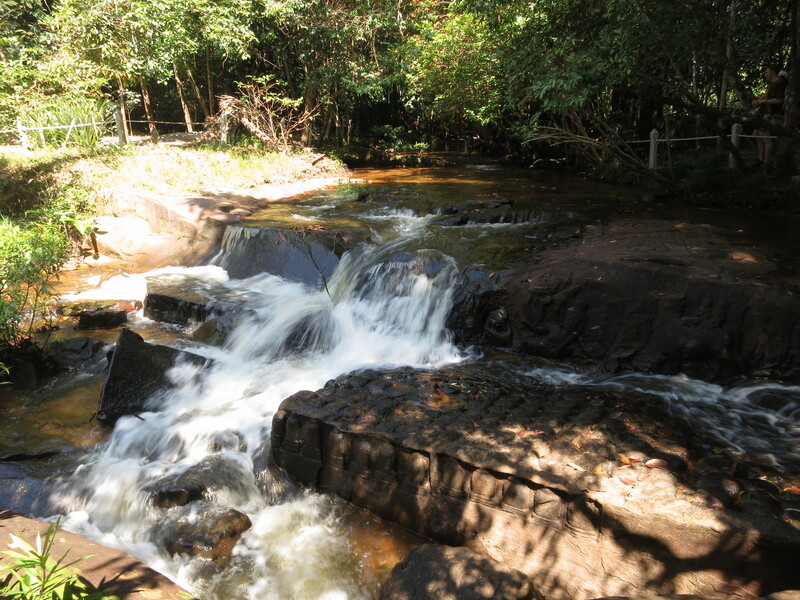 The waterfall cascades were nice, but probably we needn’t have bothered making the tuk-tuk trip out there. 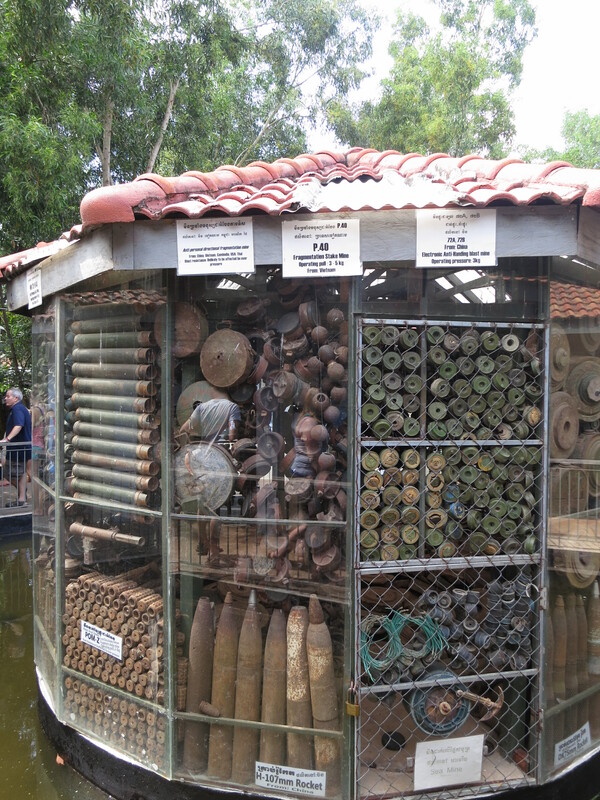 On the way back from Kbal Spean and Banteay Srei, though, we went to the Cambodia Land Mine Museum. This is a facility started by a former Khmer Rouge child soldier, Aki Ra, who has dedicated his adult life to clearing landmines – including ones he likely laid himself as a child. The story the Museum tells is predictably heartbreaking, albeit that it probably won’t come as a surprise to most people with a passing knowledge of the violent history of the Khmer Rouge regime, and the use of child soldiers in South-East Asia. Still, the Museum is a potent reminder of just how long the effects of terrible past mistakes last, and our time there was a sobering experience. 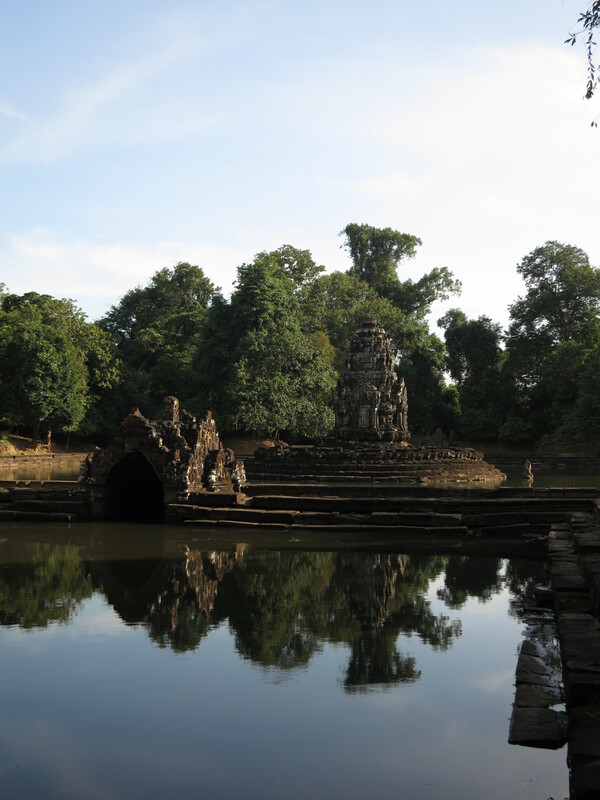 Once we’d visited the Museum, we were done with far-flung excursions, and we returned to the vicinity of Angkor Thom to visit Preah Khan. 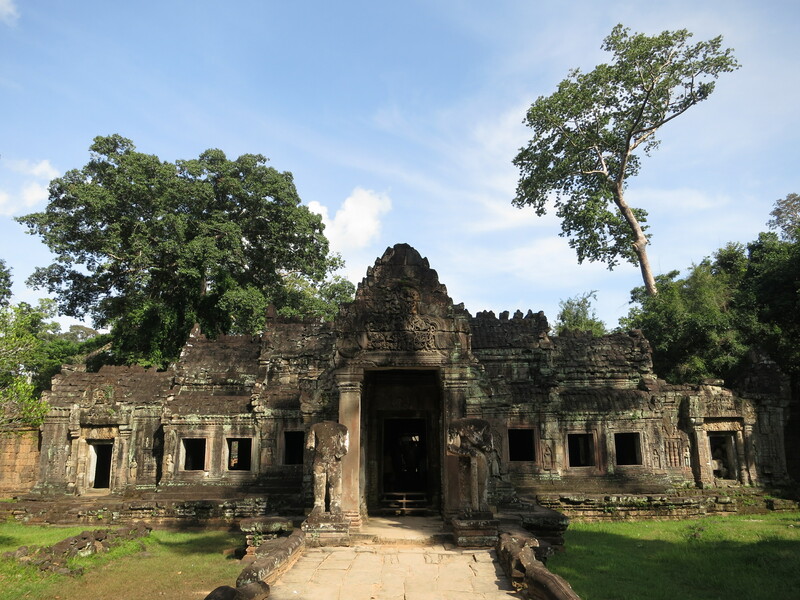 Preah Khan is another of the temples which has been left somewhat under the influence of vegetation – although not to such an extent as Ta Prohm or Beng Mealea. It’s a large temple complex – city-like in size – and affords plenty of opportunities to explore interesting little corners away from the crowds. 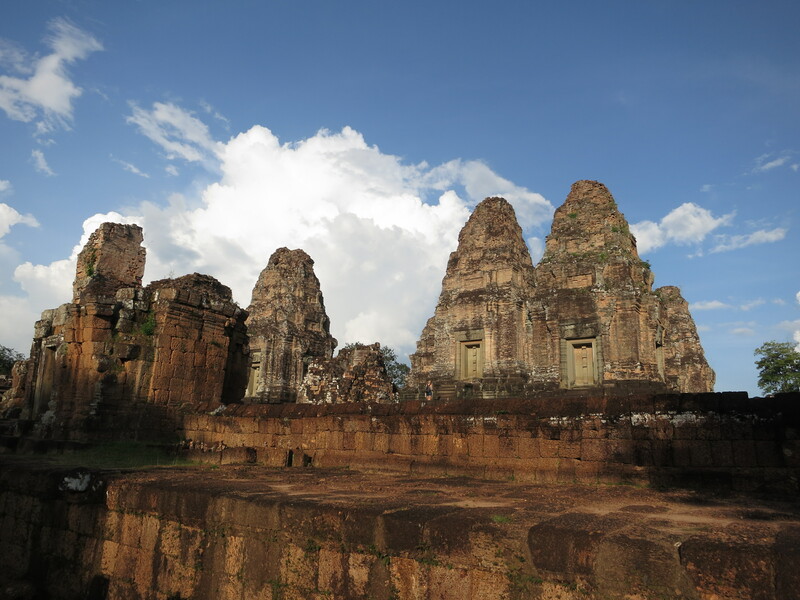 Like many of the temples in Angkor, it shows evidence of the regime’s changes between Hinduism and Buddhism over time. 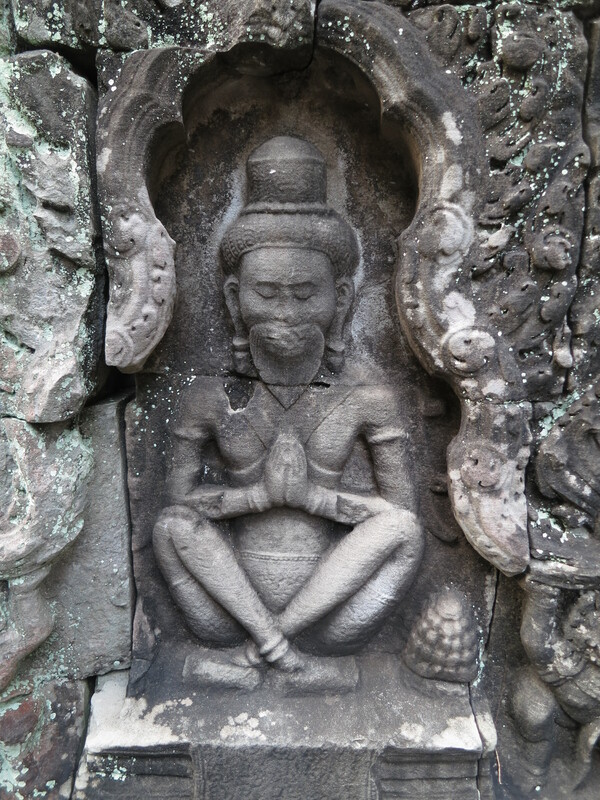 In particular, in Preah Khan the optional tourist sport is playing “spot the Buddhas with beards”: many of the devotional Buddha figures carved into the walls have been “converted” into icons of Hindu ascetics via the imposition of some particularly amateur attempts at added facial hair. “Buddha + beard = Hindu ascetic.” If only all religious conflict was this simple. 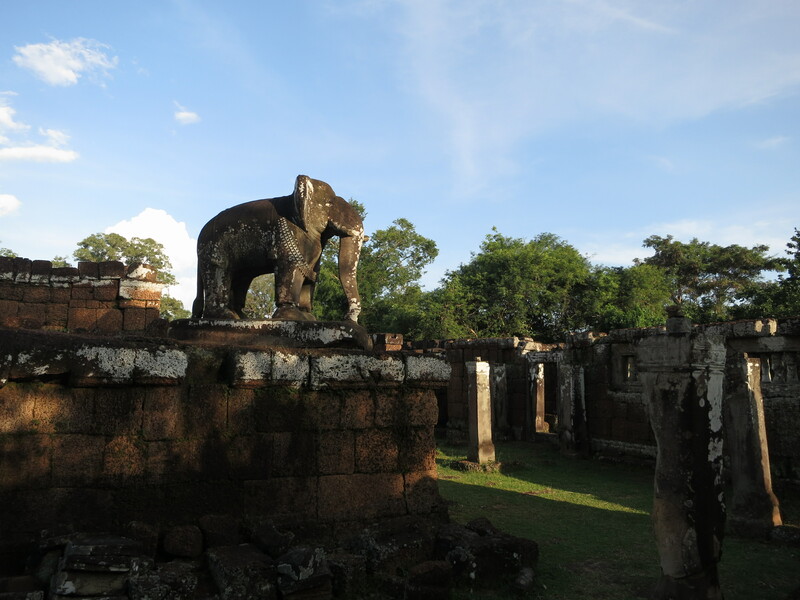 After Preah Khan, we were finally running out of both time and things to see. We quickly toured through Neak Pean (an artificial island with a temple in the middle), Ta Som (a perhaps more minor temple, albeit one with a particularly classic scene of a strangler fig above the main entrance) and East Mebon (another lesser temple, though this one with some cool elephant statues guarding the corners of its raised platform), before heading to Prae Rup, our tuk-tuk driver’s suggestion for the prettiest sunset spot. We appreciated the slow progress of the sunset – time to sit and reflect on the day as we watched the sky and stone turn ever more orange. 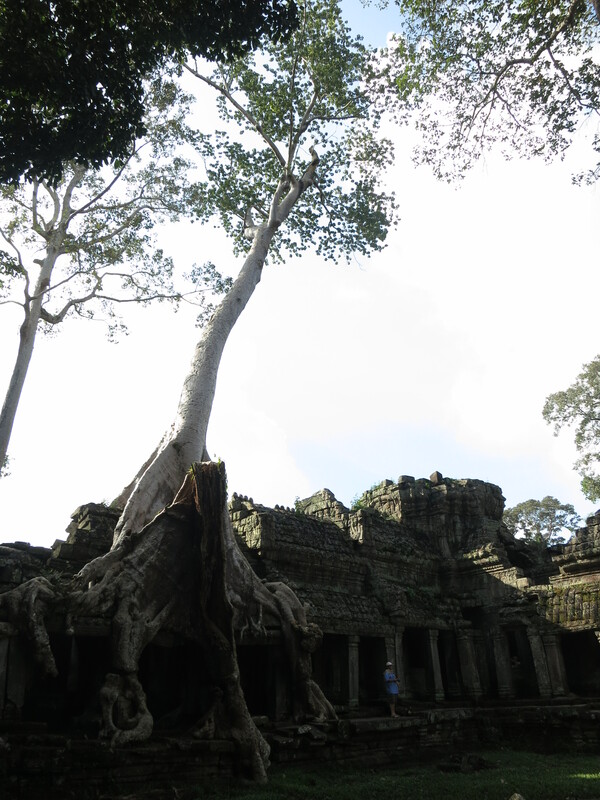 And suddenly we were done with both Angkor and our lightning trip to Cambodia. Our South-East Asia trip was halfway complete.